Kumaraswamy found himself in a raging controversy Tuesday after a video of his telephonic instruction to "shoot mercilessly" those who had killed a JDS worker in the party's stronghold of Mandya district on Monday went viral. 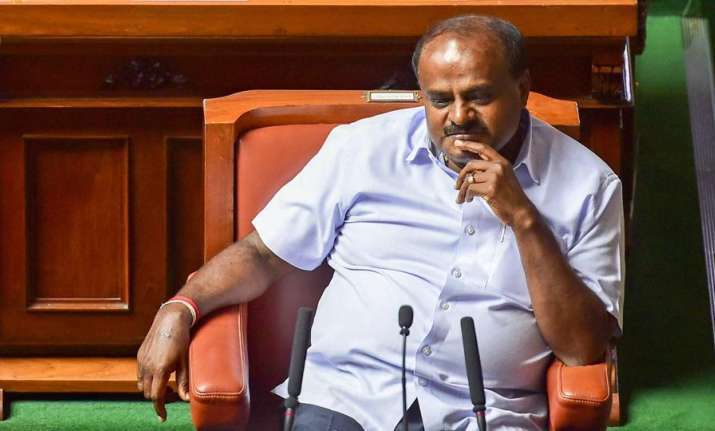 Embroiled in a row over his "shoot mercilessly" remarks, Chief Minister HD Kumaraswamy Wednesday rejected the opposition demand for an apology over his comments, saying he was an "emotional person." As the controversy refused to die down despite his clarification, Kumaraswamy said, "It is not a big issue..it is a human tendency...in that sort of a situation any human being will react like that. I have already clarified it, that is why I changed the word also." JDS worker Prakash was hacked to death allegedly by four men in Maddur town Monday evening. Claiming that he was an "emotional" person, Kumarswamy told reporters, "Even if a single citizen is in trouble, I will involve myself...that issue is over according to me, that is why I said instead of encounter, I said smoke them out...that is my final word". Hitting out at Kumaraswamy for his "irresponsible" comments, state BJP President and Leader of Opposition in the assembly BS Yeddyurappa demanded that he apologise to the people of the state. Questioning BJP leaders about an incident where two farmers were allegedly shot dead by police during Yeddyurappa's tenure as chief minister at Haveri in north Karnataka, Kumaraswamy questioned, "was it not a big issue?" To a question about the demand for an apology, he snapped back, "why should I apologise?" A human rights activist has, meanwhile, petitioned the State Human Rights Commission, terming the chief minister's remarks as a "clear violation" of human rights. The petitioner, T Narasimha Murthy, urged the Commission to issue notice to the chief minister seeking an explanation from him with immediate effect, "to examine the implications and impact of such emotional remarks on the police, judiciary and public," and to issue appropriate direction to Kumaraswamy. The plea said it hoped that the commission would examine. the issue and direct the chief minister as executive head of the state to maintain decorum and also restore the law and spirit of the Constitution.